In 1973, Forrest J Ackerman was editing a series of “bookazines” for Ace Books featuring the stories of Perry Rhodan. The character of “U.S. 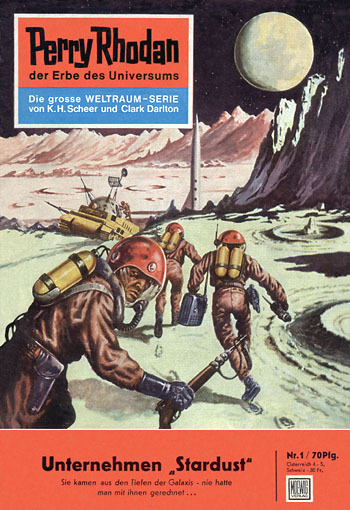 Space Force Ranger Perry Rhodan” originated in Germany in the early 1960s, and has been published in numerous pulps and digests over the intervening years. 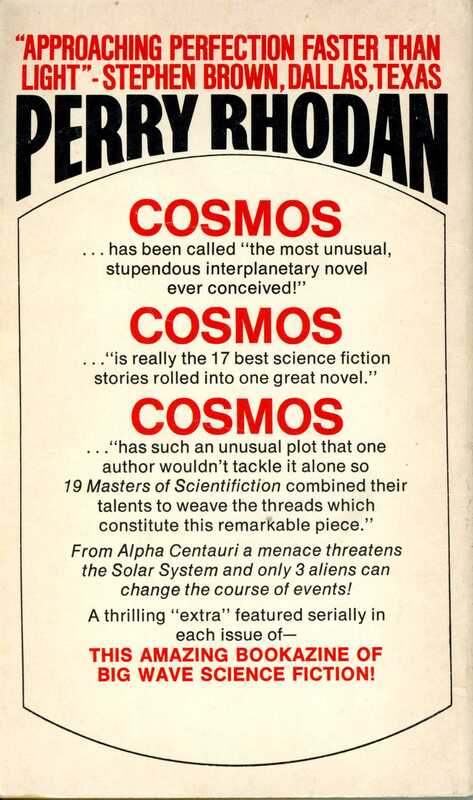 As consumers of classic swashbuckling space opera, the fans of Perry must have seemed to Ackerman a natural audience for Cosmos. 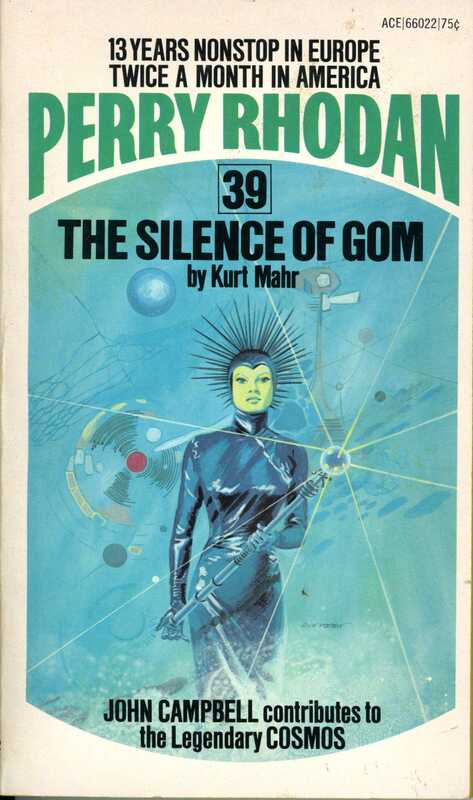 He began republishing Cosmos in Perry Rhodan 32, and spread the serial over the next 28 issues, often splitting a single chapter over multiple numbers. Just imagine an interplanetary novel involving the Earth, Moon, Mercury, Venus, Mars, Callisto, Saturn, Neptune, Lemnis, (world of Alpha Centauri), robots & alien dimensions! Co-authored by A. Merritt, author of The Moon Pool! Otis Adelbert Kline, famed for The Planet of Peril! 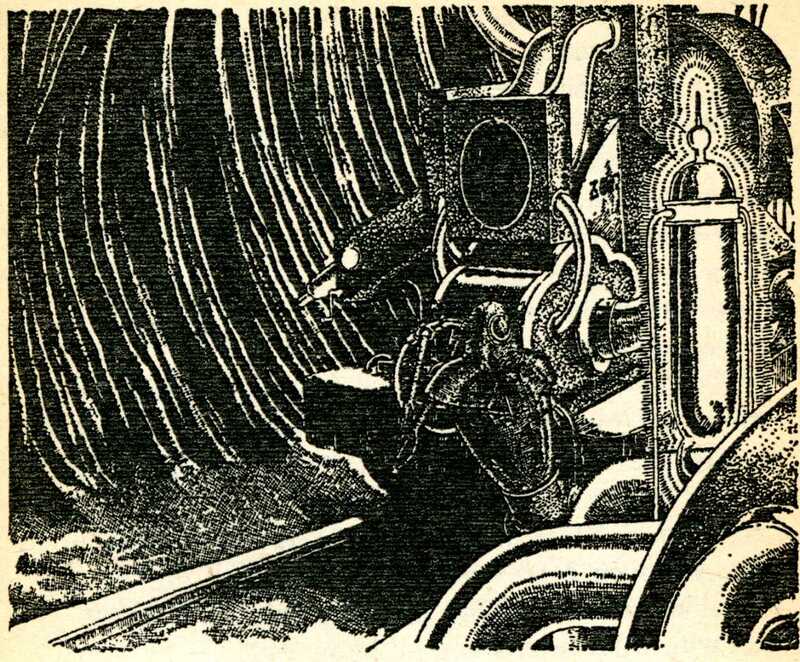 Edmond Hamilton, creator of Captain Future! John W. Campbell, the great editor who gave us The Thing From Another World! P. Schuyler Miller, dean of the Science Fiction book reviewers! E. Hoffman Price, a man who collaborated with Lovecraft! Eando Binder, the brothers who gave us Dawn to Dusk! Edward E. Smith Ph.D., the great doctor who dreamed of The Skylark of Space and the Gray Lensman of the Galactic Patrol! Containing an otherwise unobtainable adventure involving Grandon of Terra (Kline’s hero paralleling Burroughs’ Carson of Venus and Von Vangel! Well, you don’t have to imagine it because, tho it sounds too good to be true it exists! And Cosmos is its name. And its fame is being rekindled right here before your eyes in Perry Rhodan. Once upon a time you could have bought all the chapters of this super serial for $2. 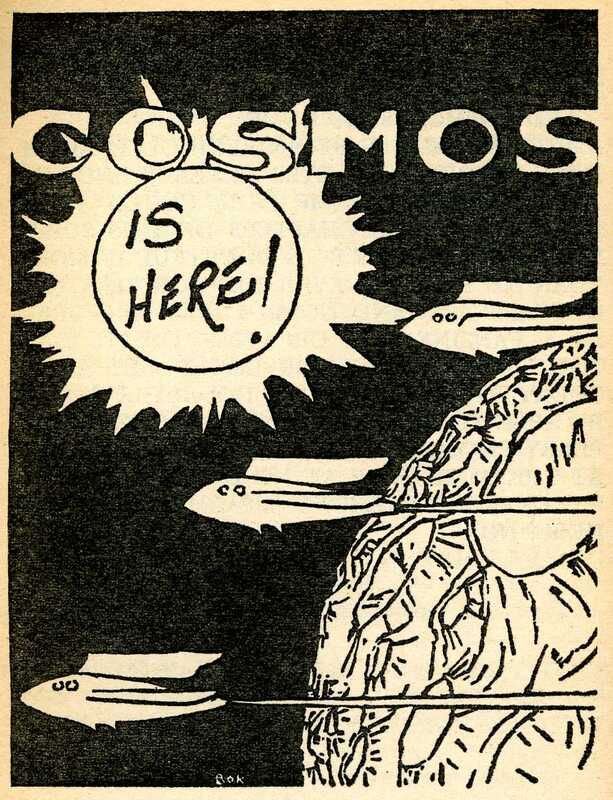 But it is doubtful if more than 500 readers ever did for this was 40 years ago and Cosmos was featured in a fanzine – the greatest of its day. You’d be lucky if you could get a set today for $200. 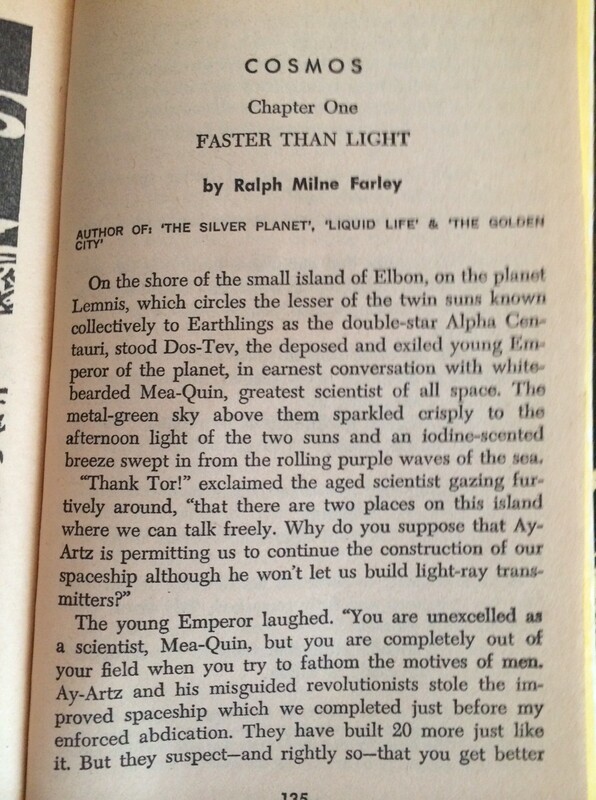 So you’re doubly lucky to be able to read not only an episode of Perry Rhodan but a chapter of Cosmos at the same time at no extra cost. Plotted by Raymond A. Palmer, starting here! Now! As noted elsewhere, Forry was not a completely faithful transcriber of the original. The version of Cosmos that appears on this site is taken from the original SFD/FM inserts. We include some of Forry’s commentary here as part of the story of the serial. DR. KELLER was a peculiar person. 40 years ago, when he flourished in the stf (scientifiction) field, he either irritate the hell out of his readers or delights the bejezus out of them. There was no in-between sentiment: he was either hated or loved. Some adored the simplicity of his work, others abhorred him as simple-minded. Your editor once personally knew a fan who said he hated stories by Dr. Keller so much that when one appeared in a magazine he would not read the story before it nor the one following! That, friends, is active dislike! In editing “The Emigrants” for republication I have just read it again for the first time in 4 decades and, tho I always was and still remain a great admirer of “the good doctor’s” body of work, I must admit that this particular episode of COSMOS strikes me as totally absurd. What earthly good (you will presently understand why you are asked to pardon the expression) is a salary, paid a lifetime in advance and taken with you, in envelopes to be opened monthly, if you are on a one-way trip to molten Mercury?! One thing about the installment: it is most atypical of the chapters to follow. Another thing about this chapter: it has a quotable quote worthy of Reader’s Digest and its Picturesque Speech department. “Weeks folded up their tired frames and went to sleep in the cemetery of time.” — now you have to admit, that’s fine writing. THE LORD OF FANTASY — that’s what he was know as in his time. And his time endures. If you are not familiar with the mastery of imaginative imagery which dwelled in the ensorcelled brain of A. Merritt, acquaint yourself here with his poetic power in this concluding half of his contribution to — COSMOS. 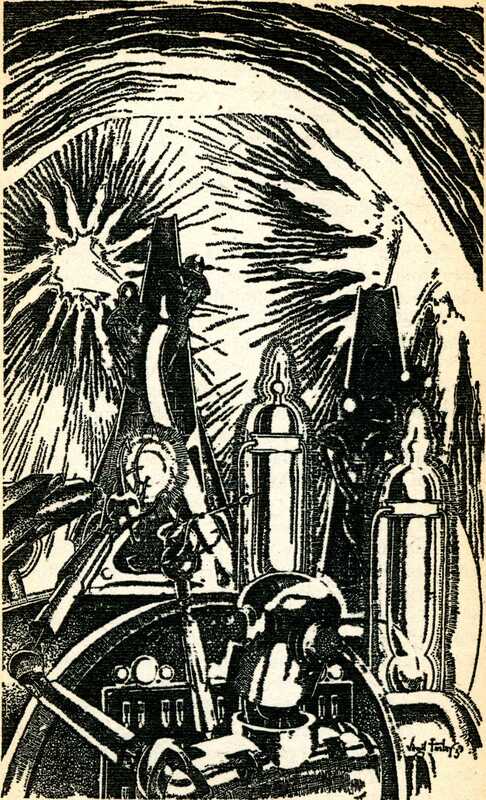 In Perry Rhodan 49 and 50, Ackerman included illustrations along with E.E. Smith’s Cosmos chapter. The art is by Virgil Finlay and was created in 1939 for the reprinting of Smith’s chapter as a standalone story (retitled Robot Nemesis, Thrilling Wonder Stories, June, 1939). Unfortunately the quality of reproduction in the paperbacks was poor.